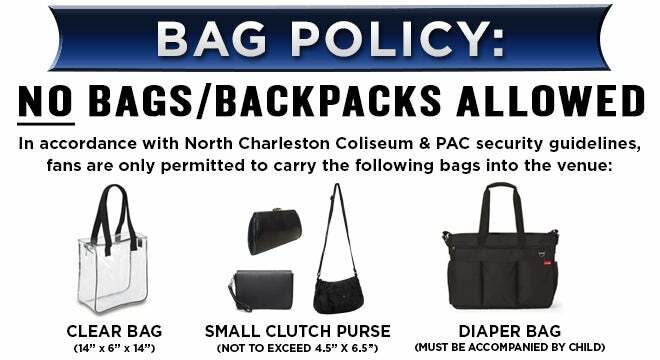 In the interest of enhancing existing security measures, the North Charleston Coliseum and Performing Arts Center enforces a clear bag security policy regulating the size and types of bags that may be carried into the venues. Exceptions will be made for medically necessary items after proper inspection at designated entrance points. Diaper bags will be allowed for families with infants and toddlers. Child must be present. Fans will continue to be able to carry items allowed into the venues such as non-professional cameras, binoculars, and smart phones as long as they are in their pockets or a clear bag. Working personnel, including credentialed media, will continue to enter the venues through designated entrances where they will be subject to screening and bag inspections. Why did the North Charleston Coliseum & Performing Arts Center adopt this policy? The North Charleston Coliseum & Performing Arts Center constantly reviews their public safety and arena security policies. We strongly believe that adjusting the policy enhances public safety and makes arena access more efficient, by limiting the size and style of bags carried into the arena. This proactive measure will both enhance safety inside and outside the arena, and speed the security screening process for all fans. The public deserves to be in a safe, secure environment. This is about safety and improving the overall fan experience. How does this make the experience more convenient for fans? This will enable us to move fans through our security check points much faster, allowing staff to be more efficient and effective in checking bags that are brought into the arena. There will be less time spent standing in lines at the arena entrances and fans will enjoy an improved sense of safety. Shorter lines mean fewer hassles. One clear bag, 14" by 6" by 14" plus a small clutch. The larger clear bag must be no larger than 14" by 6" by 14", made of clear PVC vinyl and easily searched. The small clutch allows privacy for small personal items and is also easily searched. Yes. Binoculars, phone and cameras can be carried into the arena so long as it is not in its own bag. This is not a restriction on items that fans have been able to bring into the arena. It is only a restriction on the type of container used to carry items. Some shows may prohibit cameras. Fans carrying bags that do not meet the criteria will be turned away from the arena and sent to their vehicles to leave their bags that are not permitted. If I have certain items that I need to bring into the arena for medical reasons and they won't fit in the clear bag, what do I do? An exception will be made for medically necessary items after proper inspection at the entrances. No. Unlike some event venues, we are not banning all bags. Small clutch purses, no larger than 4.5” x 6.5”, with or without a handle or strap, are permitted along with the 14" x 6" x 14" clear tote bag. This should enable you to carry the same items you have in previous years and speed entry into the arena for all fans because it will take less time to screen bags. We encourage fans not to bring any bags, but have created a policy that balances fan needs with improved public safety and convenience. No. We are limiting only the type of bags carried into the arena, not items that you normally bring to a game. You can carry keys, makeup, feminine products, a comb, phone, wallet, credit cards, etc., in your pockets or jacket if you choose not to put them in a clear bag or clutch. You can use the clear bag and clutch to carry other items. You will continue to have the flexibility to bring a wide variety of approved items into the arena. Every member of your family may carry in a permissible bag. All items in pockets must be removed prior to search at each entrance of the arena. Diapers bags are allowed for families with infants and toddlers. Child must be present. Can I bring a seat cushion? Yes. Seat cushions are permitted. If you bring a seat cushion, prepare to have it inspected/patted down prior to entry. Are the Stingrays selling clear bags? Yes. They are being sold at the Reef (Stingrays merchandise area at Section 140) and online. They cost $12.